KENNELBACH, AUSTRIA — HEAD’s Team Elite members had a remarkable week at Wimbledon, with Grigor Dimitrov’s boys singles championship leading the way. Dimitrov, a 17-year-old from Bulgaria, became the first player from that country to secure the prestigious junior title, and the ninth seed did so in impressive fashion. Using his MicroGEL Prestige Mid, Dimitrov did not drop a set throughout the tournament, which included an impressive quarterfinal win over No. 3 seed and fellow Team Elite member Cesar Ramirez of Mexico. In the final, against friend and doubles partner Henri Kontinen of Finland, also a Team Elite member, Dimitrov was able to overcome pain in his shoulder and a break in the second set to earn a 7-5, 6-3 victory. Although the final match was delayed by rain at the start, Dimitrov and Kontinen were pleased to play on world-renowned Court 1, where they had the benefit of Hawkeye, a rarity in the junior tennis world. Kontinen, an 18-year-old with a classic grass court game, had upset top seeded Australian Bernard Tomic, yet another Team Elite member, in the semifinals, but the Finn found the going tougher against the Bulgarian. The unseeded Kontinen, who uses a MicroGEL Prestige MP, was unable to break Dimitrov’s serve until midway through the second set, and unable to hold on to that break, surrendered the final four games of the match to give a delighted Dimitrov the title. 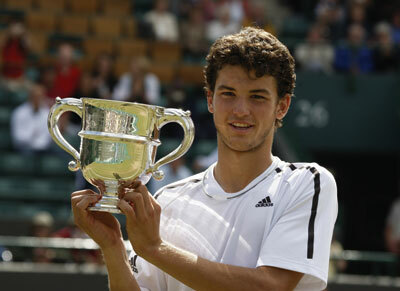 Dimitrov succeeds Donald Young as Wimbledon’s boys champion. The Team Elite member from the United States did not need to use the customary wild card from the All England Lawn Tennis Club, as he had already secured his place in the ATP Top 100 prior to this year’s event. Dimitrov is the fifth consecutive Team Elite player to capture the Wimbledon boys crown, joining Gael Monfils, Jeremy Chardy, Thiemo De Bakker and Young. In the boys doubles final, a very exciting match was decided in favor of the 2008 Australian Open junior champions Cheng-Peng Hsieh and Tsung-Hua Yang of Taiwan, who downed Tomic and partner Matt Reid, also of Australia, 12-10 in the third set. Tomic and Reid, who both use a MicroGEL Extreme Pro, had not played together before, which makes their appearance in the final an especially notable accomplishment. With Dimitrov’s win in singles, he climbs to No. 4 in the ITF junior rankings, which gives Head’s Team Elite five of the Top Ten boys competing on the international junior circuit. In addition to Tomic (2), Ramirez (5) and Kontinen (6), the list includes Henrique Cunha of Brazil, who reached the quarterfinals at Wimbledon and is ranked ninth.